UK & EU signed off on the withdrawal bill but Parliamentary approval appears a distant prospect increasing the risk of a hard exit on 29th March 2019. Jerome Powell said US interest rates remain “just below the range of estimates that would be neutral for the economy”. The comment suggested the pace of rate hikes in 2019 would abate. 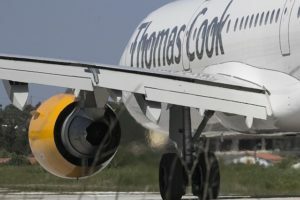 Thomas Cook had a second profit warning citing an £88m profit hit in its tour business. To end September 2018 it lost £163m with debt up sharply at £389m. Royal Mail Group reported net profit of £5m down from £168m in 2017 after a 1.5% drop in margin. CMA is to launch a full inquiry into the pricing of funeral services in the UK which could include recommendations to introduce a regulatory regime. Faroe Petroleum received a 152p per share takeover offer from majority owner DNO. The Faroe board advised shareholders to reject the offer. Kier Group launched a £264m rights issue with 33 new shares for each 50 at 409p. The new cash will reduce Kier debt quickly given reducing banking support for UK construction and outsourcing companies. Brookfield Property walked away from making a formal offer for Intu despite claiming it found nothing untoward during due diligence. Sterling is weak due to government instability. The PM’s position is precarious given the factional infighting over the proposed withdrawal agreement and the upcoming vote. Whilst comfort can be drawn at the poor political management in the Brexit factions, the PM’s survival is going to be close. 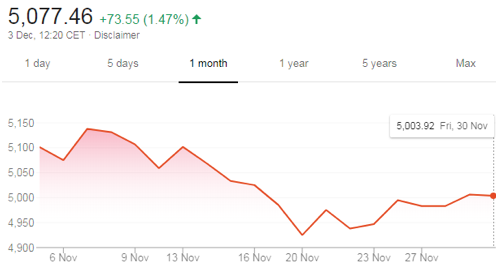 UK tobacco companies fell over November after the US Food & Drug Administration proposed a ban on menthol cigarettes, a significant revenue earner for BAT. A ban would come at a sensitive time for BAT which post Reynolds is carrying c. £48.5bn debt. November saw cash calls. Both Restaurant Group and Kier Group introduced rights issue plans that dilute equity holders. The Kier board said banks were withdrawing credit from the sector, so it had to cut debt quickly. The withdrawal of Brookfield was odd and one wonders if its real objective was to flush out other buyers. The episode damaged Intu shares taking them back to mid-90s levels. A brief chat at the G20 between President Trump and Chinese Premier Xi Jinping has led to a 90 day truce in the Sino/ US trade war. The US agreed to leave tariffs on $200bn of Chinese products at 10% whilst Beijing has targeted tariffs on $110bn of US goods. The Sino-US trade war has caused a slowing in China’s GDP growth to c. 6.5% for Q3 2018. The “deal” amounts to an agreement “not to escalate” further. At least negotiations appear to be revived with possible resolution in 2019. China’s technology stocks rallied over November as investors bought into the October sell-off. Pictures of firebombed cars on Avenue Foch and graffiti damage to the Arc de Triomphe were awaiting President Macron’s return from the G20 meeting. The current violence, considered the worst since the student riots in 1968 has not yet led the leadership to back down from planned hikes to petrol duties. The survival of the Macron presidency is seen as vital to the survival of the EU centrist order under threat from far right onslaughts in Germany, Austria and Hungary. The lower public support for Macron is a worry for the EU project. The CAC 40 fell 1.8% over November, a muted response to the unrest. GDP growth in 2019 is expected at 1.6% (Bank of France). The apparent Powell climbdown on US interest rates now suggesting current Federal funds i.e. money market rates are “not far below” a neutral rate begs the question as to whether President Trump’s public berating of the Federal Reserve has worked. Whilst the December 18th/ 19th meeting should see another hike, attention is turning to 2019 and the prospect of maybe only one rate hike. Apple Inc dropped from $222 per share to $178 over November on concerns over slowing growth in expensive iPhone sales and weaker demand in China and Japan. President Trump’s threat to impose a 10% tariff on iPhone sales in the USA was dismissed as a bluff move, but the board’s decision to withdraw publication of unit sales hurt transparency. Elsewhere in the US techs, Alphabet rallied from $1,040 to $1094 over November as investors treated the sell off as a buying opportunity. 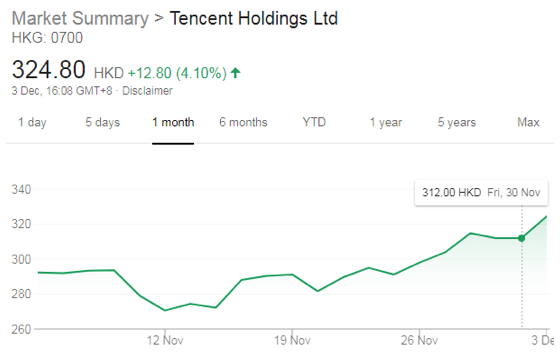 However Facebook ended at $140.61 from $148.68 as new allegations emerged over website content and a poor Q&A session as the CEO tried to address criticism of Facebook made in the New York Times.